I try to use vegetables that are in season as much as I can. Have you noticed how all the vegetables which are in season in the winter months are meant for winter cooking? – cauliflower, celeriac, mushrooms, pumpkin, broccoli, cabbage, potatoes and fennel are great in soups, stews and casseroles. My local fruit and vegetable shop is the Mount Lawley Growers Market. It’s great to have a growers market so close to me as I always have a great selection of produce to choose from to cook with. I like the fact that everything is clearly colour coded with where it has come from – yellow indicates W.A. grown, green is Australian and red means imported. In one corner there is a refrigerated section with a collection of herbs, mushrooms and a selection of I guess what you would call more fancy vegetables. The growers market is also a great place to buy various nuts and snacks. Everything is much cheaper than what you would pay for from a supermarket and when I go in the mornings to do my food shopping I see the shelves getting stacked with fresh fruit and vegetables that I imagine have come straight from the farm. Seeing lots of beautiful cauliflower heads, I decided use one to make some soup. Cauliflower is kind of like tofu – often seen as bland and having no taste. But it depends on how you cook it and what you pair it with. Do it well and you will have something that’s delicious. Searching for cauliflower recipes on the internet, I came across many different versions. Popular ways of cooking cauliflower soup incIude adding in some spices into the mix and cooking cauliflower with bacon (of course everything tastes better with bacon right?). This recipe for cauliflower soup from the ABC’s Cook and the Chef caught my eye as it was evident that the cauliflower was the star with the addition of celeriac and leeks acting to provide depth to the flavour of the soup but not to overshadow the cauliflower. What also really interested me about this dish was the mushroom garnish. Generally, these sorts of puree vegetable soups are garnished with a swirl of cream and some chopped herbs like chives or parsley. Here, the recipe garnishes the soup with sautéed mushrooms. Cauliflower, celeriac and leeks provide a great foundation for a vegetable soup but the mushroom garnish was like the icing on a cake. It really lifted the soup to something else, with every mouthful of creamy cauliflower soup accompanied by a burst of sautéed mushroom and thyme flavours. Clean leeks, slice in half, wash under running water and slice using the length of the leek till it becomes dark green. Peel celeriac with a knife rather than a potato peeler, and chop into 1.5cm x 1.5cm pieces (the cauliflower will darken (oxidize) when exposed to air - to retard darkening, toss with lemon juice or keep in a water bath of warm water and lemon juice). Melt butter in heavy based pot and sauté leeks, garlic and shallots over gentle heat for 10-15 minutes until soft but not browned (cover and sweat). Add the celeriac, stir and then add the cauliflower. Season with salt and pepper, and stir to coat everything with the butter. Add all the chicken stock, cover, and simmer until tender, about 35 to 40 minutes. Once tender allow to cool a little (around 15 minutes), then blend until smooth. Put the pot back on the stove, add milk and adjust seasoning with salt, pepper and nutmeg. Make garnish by melting butter, then adding a dash of evoo and sauté the mushrooms until slightly browned. Then add thyme, salt and pepper, and sauté for a further 1-2 minutes. Finish with a squeeze of lemon and take off the stove. Serve the soup in a bowl with a spoonful of the mushroom garnish in the centre. Whilst you can order rice paper rolls at any Vietnamese restaurant and be assured that you will get a reasonable replication and there are always reliable pho joints around town for your pho fix, getting a decent banh mi is another matter. My very first blog entry was about banh mi and where you could get the best banh mi in Perth. My family always bought our banh mi from Ben Thanh at the Mirrabooka Village Shopping Centre. I got a few comments on that blog entry telling me about other places selling banh mi worth checking out in the Girrawheen area which is known for having a large Vietnamese community. Not that I can prove this in anyway statistically, nor have I conducted a survey of the people who live in the area. But I don’t think this is necessary because you can tell that a large number of Vietnamese people live in the area by the quality of its suburban Vietnamese restaurants (Kim’s Café and Noodle House and Pho Hynh to name a few), and by checking out the produce sold in the Asian supermarkets within the area. Not all Asian supermarkets are the same, each specializes in selling specific goods and what is demanded by its customers. Walk into any Asian supermarket in the Girrawheen area and you will find a larger selection of Vietnamese style sweet and savoury snacks near the counter than any Asian supermarket down William Street in Northbridge. The variety and freshness of the herbs available which is vital to a lot of Vietnamese dishes is also abundant in supply. Girrawheen feels like Perth’s equivalent of Cabramatta in Sydney. There is even a Vietnamese video shop and many Vietnamese butchers around the place. Nguyen Phat Farmer Jacks is your everyday supermarket like IGA but the shopping aisle signs have Vietnamese translations. I have been journeying to Girrawheen over the past few weeks to find the best banh mi that Perth has to offer. I have checked out three places in Girrawheen, little shops that only sell banh mi, made fresh to order, all within five minutes drive from each other. The fact that these little establishments can sustain themselves by only selling banh mi shows that you don’t need to offer a variety of rolls to keep customers happy, do one thing really well and that’s all you need. These three places were recommended to me by readers of my blog and are run by Vietnamese people so expect an occasional language barrier when you are being served depending on who’s working on the day – it’s all a part of the experience of consuming an authentic banh mi. The best banh mi in my opinion is one that has a light toasted, crispy baguette with some tasty thinly sliced roast pork belly, it’s seasoned well (with condiments such as mayo, soy sauce, salt and pepper, pate etc. ), and has a good balance of meat to pickled vegetables (generally carrot and daikon) and fresh herbs, especially a lot of coriander. Plus, some fresh cut chillies if you desire some heat too. It should feel light but be an explosion of rich beautiful flavours in your mouth with contrasting textures. Whilst banh mi may contain quite a few ingredients, as you bite into it, all the different elements come together as a whole and I think there is one word for this – it’s SYNERGY. I think this is why banh mi is so satisfying to eat. Even though banh mi will generally be composed of the same ingredients no matter where you buy it, each place that sells banh mi will be slightly different. There will be differences in the bread roll, liver pate and sauces used, the balance of flavourings and ratio of meat to vegetables. Each will give you a different mouthfeel. Banh Mi Nhu Mai is located at Shop 1: Newpark Shopping Centre, Templeton Crescent, Girrawheen WA 6084, next to the Commonwealth Bank. Open everyday 7am – 5pm. I now have a new favourite banh mi place in Perth. I rate the banh mi at Banh Mi Nhu Mai slightly above Beh Thanh which has been my family’s favourite banh mi place since like forever. Overall, I think that Banh Mi Nhu Mai has the most synergy. Two things about Banh Mi Nhu Mai that stand out for me is that they have a larger selection of meats to choose from to stuff your banh mi with and I really like the baguette that they use, it’s light and crispy. 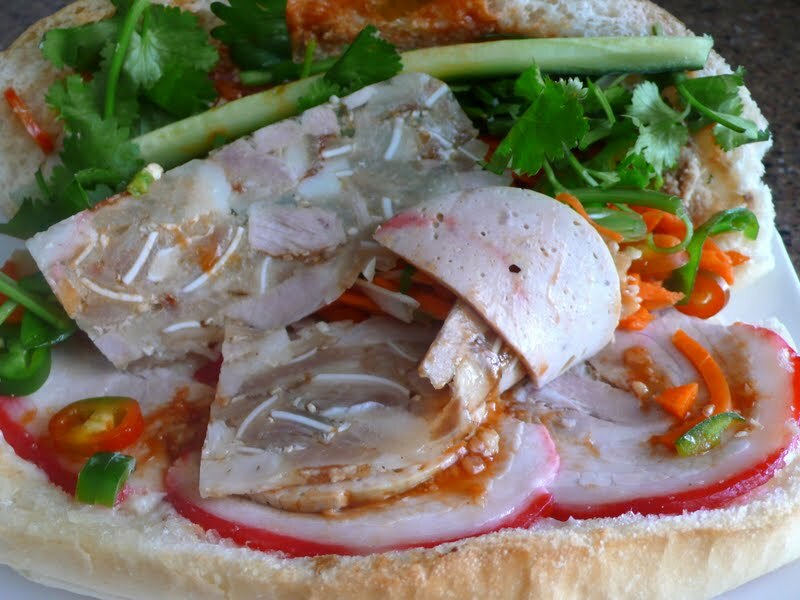 While Beh Thanh offers the standard stuffing of thinly sliced roast pork belly and Vietnamese ham (goi lua), at Banh Mi Nhu Mai you can get a combination roll with includes the addition of Vietnamese head cheese, Vietnamese nem, as well as the roast pork belly and Vietnamese ham. I find the balance of vegetables to meat also better at Banh Mi Nhu Mai and they provide a generous amount of coriander. However, the one thing that Beh Thanh has over Banh Mi Nhu Mai is its pork liver pate. The banh mi at Banh Mi Nhu Mai didn’t have any pate but their own special red mince sauce mixture. When I asked the lady at the counter what was in the sauce…well after I repeated my question a few times and then pointed at the bowl of sauce, she didn’t speak much English but in the end she said two words to me “meat balls”. Ok, so I think I understood what she was trying to tell me, sometimes you can get banh mi with meatballs and I think that they have cooked this but instead of little meat balls they have kept the meat minced in a rich thick sauce which they spread a layer of in the roll. The mince sauce is delicious but pork liver pate adds another dimension of flavour to the roll so for lovers of offal, you will like the banh mi from Beh Thanh more. The pork liver pate from Beh Thanh is the best that I have tasted so far because it is rich in flavour and has a nice thick texture, I find the pate at other places more runny and lacking in the flavour department. I would be pretty content with eating banh mi from either Banh Mi Nhu Mai or Beh Thanh but if I had to choose, I would go for Banh Mi Nhu Mai but only just! You can read more about banh mi at Beh Thanh at my previous post and here are some recent photos. Pate in Ben Thanh's banh mi. Pate in Nuoc Mai Mien Tay's banh mi. Nuoc Mai Mien Tay is located at 7/3 Wade Court, Girrawheen WA 6084, outside Nguyen Phat Farmer Jacks. Open everyday 7:30am-8pm. I quite like the banh mi at Nuoc Mai Mien Tay, the base seasonings are good and that is a balanced ratio of meat to vegetables, although the bread is more crusty and not as crispy and flaky as other banh mi places. It's also a bit different from the others as they add in a lashing of vibrant red sauce. The taste of the sauce reminds me of the marinade for Chinese BBQ pork (aka char siu) – sticky, savoury and sweet with hints of spice. The sauce makes the whole roll really flavoursome and succulent. Whilst I enjoy the taste of the red sauce, after repeated consumption of the banh mi I find that it can overshadow the flavours of the rest of the ingredients and could probably do without it. However, I think that people who really enjoy Chinese BBQ pork will like this banh mi and appreciate the addition of the sauce. I could probably ask for a banh mi without the red sauce, this is an option I have not tried yet but when you order banh mi at Nuoc Mai Mien Tay, this is how they serve it, so it’s a part of how they make their banh mi. Every banh mi place has their own little twist on the roll. Tan Hiep Hung is located at 2/70 Marangaroo Drive, Girrawheen WA 6084, next to a pizza shop. Open everyday 5am-5pm. The banh mi at Tan Hiep Hung has been my least favourite place for banh mi. The downers for me are its bread which is not as nice as others I have had, I think its pate lacks flavour, the roast pork belly is sliced too thick and the ratio of vegetables to meat is not very balanced. The first time I bought a banh mi there, it had way too much carrot but was very generous with the mayo. I tried the banh mi at Tan Hiep Hung for a second time because I didn’t want to just base my judgement on one experience. But the second time that I tried it, the banh mi was overly salty as it contained too much soy sauce. Overall, my experience of banh mi at Tan Hiep Hung has not been as good as other places that I have tried. I don't think that enough care and attention is paid to the construction of the banh mi and balancing all the different elements. One bonus though is that they are open at 5am in the morning for people who have an early morning craving! So in summary, here are the banh mi places I have tried in Perth and a rough score, but any of the first three are great, I recommend trying them all. Everyone has different tastes and may appreciate different elements of the banh mi from the various places I have tried and have a different opinion on which place is the best, so I would be interested in hearing other peoples thoughts. Are there any other places I should try? For around 4-5 dollars you can get yourself a delicious and fulfilling banh mi. I find that a bargain. If you were to get yourself a decent/gourmet sandwich or roll at any café around town you would be setting yourself back an average of 7/8 dollars so put that extra few dollars towards transport costs and make the journey to Girrawheen, it will definitely be worth it. I also recommend buying an extra banh mi to take home for the next day. The banh mi must be refrigerated but when you are about to eat it, take it out of the fridge for about 30 minutes to bring it to room temperature and then pop it in the oven/under the grill for a few minutes to crisp up the baguette. What is your favourite Banh Mi place in Perth? Tofu is made by coagulating soy milk and then pressing the resulting curds into moulds which are allowed to drain. The curds will stick together, producing soft white blocks. The process of making tofu is similar to cheese making. There are two main kinds of tofu, silken/soft tofu, and firm/regular tofu. Both can be found in soft, medium, firm and extra firm consistencies. They are made from the same ingredients, but the curds are processed differently depending on the form of tofu that is being manufactured. Silken tofu contains the highest moisture content and is curdled directly into the tofu’s selling package. For firm tofu, the curd is cut and strained of excess liquid using muslin and then lightly pressed to produce a soft cake. Firmer tofu is further pressed to remove more liquid. Choosing the right type of tofu is important for cooking. Firmer tofu will hold its shape when handled so it is the best form to use in a stir-fry while silken tofu breaks up easily and can be used in dessert dishes. I used silken tofu silken for this dish as it was just put on a plate and steamed, and was not cooked in a way that would make it break apart. I love the melt in your mouth custard like texture of silken tofu and it’s great with some mince pork on top. The pork mixture provides flavour and a textual contrast. Season the minced pork with a little salt, white pepper, fish sauce, oyster sauce and mix together well. Refrigerate for 30 minutes. Steam the block of silken tofu for 8 minutes on low heat. While the tofu is steaming, make the sauce. Heat a frying pan with a little olive oil. Add in the crush garlic, grated ginger, finely diced white part of the spring onion and fry for 1 minute until fragrant. Then add in the mince pork and fry until golden brown making sure that you break up any clumps. Then add in the shiitake mushrooms and fry until the mushrooms have browned. Add in some salt, white pepper, sugar, light soy sauce, oyster sauce, fish sauce and fry for a few minutes. Then deglaze with Shaoxing wine. Add in the stock and simmer for a few minutes and then thicken the mixture with the cornflour mixed with a little water. When the tofu has finished steaming, discard the excess water before spooning on top of the tofu the mince pork sauce mixture and garnish with some spring onions and coriander.